Throughout the years-long "John Doe" investigation into Scott Walker's staff during his time as Milwaukee County Executive, Wisconsin's current governor feigned ignorance: he insisted that he had no knowledge of the campaign activities taking place within his office, implied that he did not know his employees were using a secret email system and private email accounts, and told the press he had no idea that prosecutors had raided the home of a top aide. Thousands of pages of emails unsealed last week indicate Walker and his staff knew much more than they were letting on. 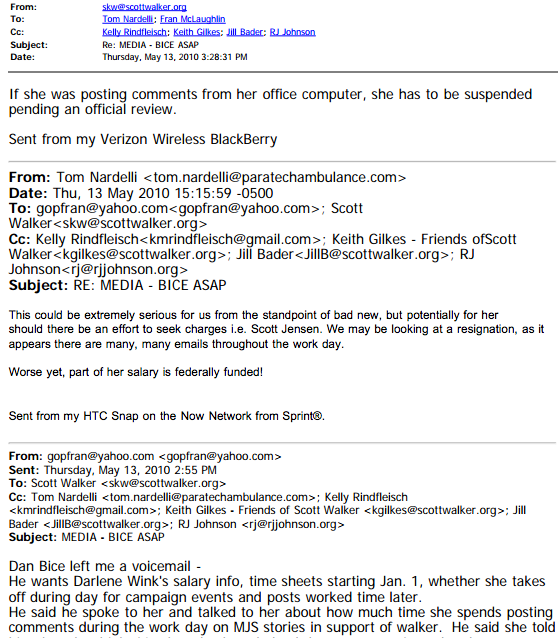 The John Doe saga began unfolding in May of 2010, after Milwaukee Journal Sentinel reporter Dan Bice followed a tip that a Walker staffer, Darlene Wink, had been posting partisan comments to news articles during work hours. In the months to come, the story would blossom, with prosecutors soon uncovering reams of evidence that Walker's County Executive staff were conducting campaign work on the taxpayer dime. "This could be extremely serious for us from the standpoint of bad new (sic), but potentially for her should there be an effort to seek charges," he wrote in the email, sent to both campaign and county staff -- and to Scott Walker himself. "We may be looking at a resignation, as it appears there are many, many emails throughout the work day" (emphasis added). The Milwaukee Journal Sentinel did not contact Walker's office to ask about emails; Bice's inquiry was only about the office's knowledge of Wink leaving comments on news articles. On the date Nardelli sent that message, Walker, his staff, and his campaign had been conducting campaign activities over a secret email system for months. Staffers used personal email accounts to avoid disclosure of their communications through open records requests; a Walker aide boasted in one email sent during the workday that "I use this private account quite to communicate with SKW and Nardelli," referring to Walker by his initials. In the months and years to come, an investigation by the Milwaukee County District Attorney's office would soon uncover thousands of emails -- many sent over the secret email system 20 feet from Walker's office -- showing that Wink and top Walker staffers were engaged in campaign activity while being paid by taxpayers. Notably, the criminal complaint filed against Wink two years later would not be premised on her online commenting, but based on extensive evidence that she was organizing fundraisers for Walker, writing press releases, and communicating with campaign staff while being paid by taxpayers and using taxpayer resources. Deputy Chief of Staff Kelly Rindfleisch would also be charged for campaing activity and fundraising; other staffers were given immunity deals, and two others were charged with embezzling more than $21,000 in funds intended for veterans and their children. Nardelli's May 13 message suggests that he recognized that there was more at stake for Walker than staffers posting comments to news articles. But in a statement that Walker himself approved and helped draft, his office sang a different tune for the press. "The county executive (Walker) and chief of staff (Tom Nardelli) expressly forbid staff participation in any campaign-related activity while on county time," Walker's spokesperson told the Milwaukee Journal Sentinel. Wink resigned when confronted about the posts, Walker's office claimed. Was Wink Really Cut Loose? Almost two years later, Walker continued to insist that Wink was cut loose because she violated the clear policy of the office. "For us, when we found out about Darlene Wink it was clear," Walker told Milwaukee's ABC affiliate WISN in January 2012. "Within hours of finding that out we asked her to resign, even though she had done a lot of great work for constituents, even though she was a very nice lady, she violated the terms of the policy we had set," Walker said. 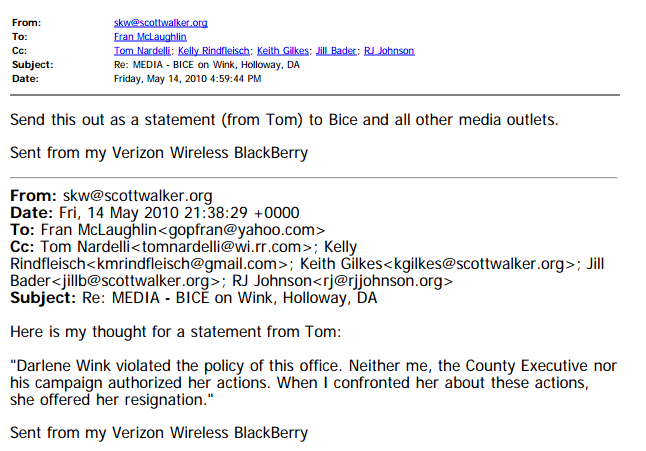 Other emails indicate that Walker called for Wink's suspension -- rather than her resignation -- when Bice first asked about her internet activity on May 13, 2010. Additionally, earlier that same day, at 8:18am, Walker sent an email to Chief of Staff Nardelli with the subject line "Op Freedom," writing "we should still have [Wink] involved to protect the interests of this office." A month later, Wink apparently continued to do work with Walker's office on "Operation Freedom," an annual event for veterans and their families. In a June 10, 2010 email sent one month after she "resigned," Wink emailed Deputy Chief of Staff Tim Russell about $11,000 missing from the fund, which had been set aside for the children of soldiers killed in Iraq and Afghanistan. "Take a look at this - KK is either lying or can't read," she wrote of the discrepency, referring to Walker appointee Kevin Kavanaugh. Both Russell and Kavanaugh would later be convicted of seven felonies combined for embezzling the veteran's funds. Referring to Wink's internet comments, Walker told WISN in January 2012, "clearly if we had known anybody else out that had done that, we would have applied the same standard." However, a Milwaukee Journal Sentinel review of records shows that Walker had personally instructed staff to post comments to news articles, just weeks before Wink was caught for doing just that during the work day. For example, on the afternoon of Friday, May 4, 2010, just one week before Wink was ousted for her online commenting -- which Walker would later describe as an unauthorized and isolated incident -- Walker urged his county staff and campaign to leave comments on a Milwaukee Journal Sentinel story about his plan to privatize the airport. "Someone should comment on the fact that the only way for the county to benefit from that success is to contract out operations," Walker wrote in an email. "Having a well performing airport increases the value that the county could receive." Thirty minutes later, a Walker volunteer, Brian Pierick, replied that he had posted a comment on the story under an alias, praising "Scott Walker's outstanding leadership." (Pierick would later be charged with two felonies for trying to entice a 17-year old into his van). On Saturday, April 17, an email showed Walker urging his county spokesperson, Fran McLaughlin, to comment on a Journal Sentinel story about a closed public pool. (McLaughlin later arranged an immunity deal in exchange for her testimony). "Fran, you should post a comment (since they did not ask our office) that notes that this was closed by (former County Executive) Tom Ament," Walker wrote. On Saturday, August 21, months after Wink was ousted for her internet comments, Walker cabinet member Cindy Archer sent an email to Walker and his campaign and county staff: "I know you have all told me to stay off the blogs. 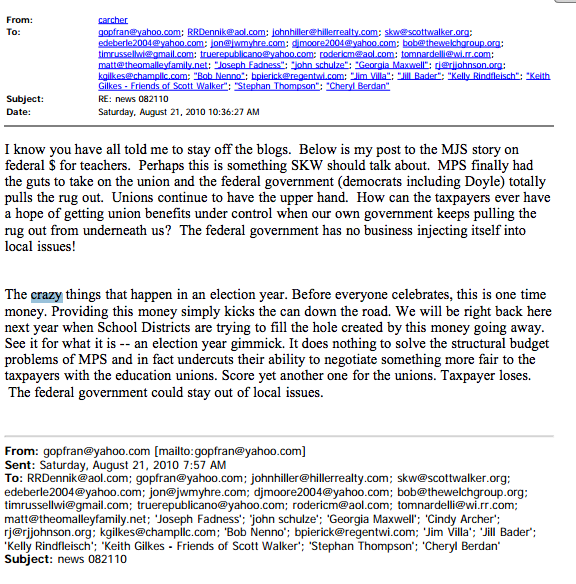 Below is my post to the MJS story on federal $ for teachers. Perhaps this is something SKW should talk about," referring to Walker by his initials. The Milwaukee Journal Sentinel identified that Archer's comment was posted under the name "capt1." "Capt1" posted around 114 comments to the Milwaukee Journal Sentinel in 2010 and early 2011, including several during work hours. After being elected governor, Walker would appoint Archer to the #2 position at the state's Department of Administration. "Walker May Have Known More -- Much More -- Than he Was Letting on"
On August 20, 2010, when prosecutors raided the home of Walker aide Tim Russell and confiscated his computer, Walker gave the impression he knew nothing about it. 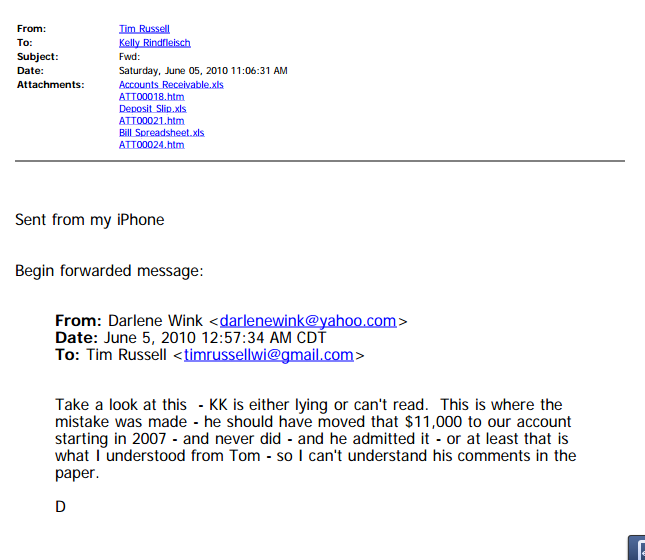 "Tim's not said anything to me," Walker told the Journal Sentinel in a story published August 23, 2010. Asked if he was surprised by the timing of the probe, Walker said: "I can't be surprised by something I don't know about." But according to Dan Bice of the Milwaukee Journal Sentinel, "email records from the secret investigation suggest that Walker may have known more -- much more -- than he was letting on." Late on the evening of the raid, Walker's county aides sent emails informing Walker and one another that they had been contacted repeatedly by the Journal Sentinel. "We don't have a comment," Walker said late that evening, without identifying the subject. "To protect everyone, our comment should be that we don't know anything about it," responded Tom Nardelli, Walker's chief of staff. 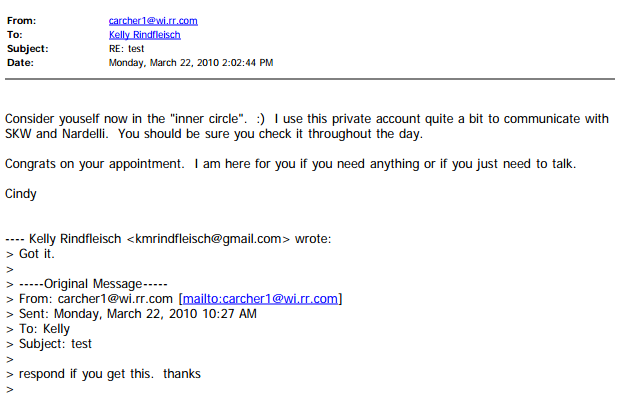 Early the next day, then-Walker spokeswoman Fran McLaughlin sent an email to Kelly Rindfleisch, his deputy chief of staff, about Russell. "I'm guessing Tim's closed-door meeting with Scott had to do with Bice's calls," McLaughlin wrote. The day after the raid, on August 21, Walker's county administration director, Cindy Archer, wrote an email to Walker with the subject line "heads up." "I am not really in the communication loop with Nardelli anymore so you may already know this," she wrote. "the DA came in yesterday and took Tim Russell computer???" The next day, Walker told the press he had no knowledge of the raid. "We Operate at High Integrity"
"The bottom line is, I know how I have conducted myself in public service," Walker said in October 2011, when asked about the John Doe. "It is the traditions I have from my parents; it's part of how I obtained the rank of Eagle Scout. We operate at high integrity." a polite euphemism for "lied"? If SKW & Co. knew of the many emails exchanged over the secret mobile hot-spot, then why didn't they release any of those emails when asked in subsequent open records requests? Darlene Wink resigned on May 13, 2010 admitting to campaigning during the work day. Walker's "no more laptops" email was sent on May 14. On May 25, County supervisor John Weishan made an open records request to Walker's office, looking for evidence of campaigning "on any personal computers" in Walker's staffed office. His request was stalled until July, and ultimately he was charged more than $2,800 for a series of records that did not include records from the recent dump. We can now see that these email records should've been surrendered, but they weren't. There was deliberate evasion going on. Even if you accept the claim that Walker only learned of the "secret router" on May 13, they all should've complied correctly to the subsequent open records requests. Similarly, the email dump shows that Mark Neumann's campaign made a similar request on June 7, and these "secret router" emails were not surrendered. Because the media just dutifully records Walker press statements with minimal fact checking or logical analysis Walker is 'telling the truth' in that what he says is what he wants to put out to the media. Walker probably concluded long ago that the media isn't really interested in truth from him as long as the Koch brothers and the oligarchs keep buying ads on his behalf. To properly cover Walker you would need to spend twice as much of your media assets unwinding his lies, misdirections, and off topic misleading facts than you do in covering what he says and does. You might then get some heat and lose some revenue from the oligarchs. Faux Nooz shows that people will watch consistent propaganda as long as it feeds your hate, anger and prejudices so why be accurate? Why hasn't Walker been charged yet? *LYING* is a way to WIN VOTES and influence public policy by pouring MILLIONS of DOLLARS into DECEPTION based on campaigns designed to MANIPULATE PUBLIC OPINION... Walker is the HOUDINI of DECEIT... and his promises of 250,000 jobs is a WHO/HA and with both the SPEED TRAIN and the Kenosha casino, he used the SAVING TAXPAYERS MILLIONS of DOLLARS as his EXCUSE.